GRAND TETON NATIONAL PARK, Wyo. (CNS) — Mary Morris was lured to the Chapel of the Sacred Heart inside of the national park by a small wooden road sign. Morris had been camping in Yellowstone when she made the drive south to Grand Teton National Park. She walked through the chapel door, made the sign of the cross, signed a guestbook and ducked into a pew to pray. Afterward, she said the beauty of chapel in the Tetons made her feel grateful. The chapel’s all-log construction is in character with the mountain environment. Inside, shadows of swaying pine branches flitter behind the saturated hues of a single stained-glass window. The space is warm and quiet. Deacon Doug Vlchek has heard similar impressions expressed by other Sacred Heart visitors many times over. The Catholic deacon lives in Grand Teton National Park and has had a connection with the chapel for much of his adult life. It’s the place he says that makes him feels closest to God. The chapel was constructed in 1937 before the expansion of Grand Teton National Park. It now sits within the park’s boundaries and is a summer mission of Our Lady of the Mountains Church, where Deacon Vlchek is based in nearby Jackson. “On any given day we probably have 100 to 200 people come and visit this chapel, sit and pray for a little while, have a beautiful respite and some time to spend with God,” he said. When the church and chapel were founded in the late 1930s, the population of Teton County was 2,500 and was considered mission territory by the church. Today, the county has more than 22,000 residents and annual visitors numbering around 4 million. The chapel has been restored twice, in the late 1960s and again in 2002. The latest renovation included new log beams, a new sanctuary and the addition of the Sacred Heart stained-glass window. The total cost — $450,000 — was funded by a single New York and Wyoming family in memory of the victims of the 9/11 terrorist attacks. Sacred Heart is open 24 hours a day June through September. During those months, Mass is celebrated Sunday evenings. It’s closed in the winter. Although a log chapel inside a national park might seem uncommon, there are actually two within Grand Teton. Chapel of the Sacred Heart is located near the shore of Jackson Lake across from Signal Mountain. Further south, near the park’s Moose entrance, is the Episcopal Chapel of the Transfiguration, constructed in 1925 to serve ranchers and tourists. Both worship spaces welcome all visitors. 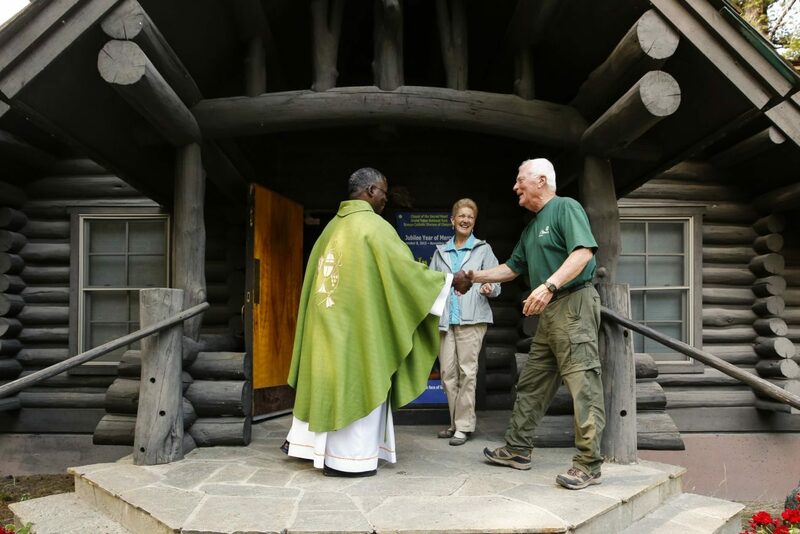 During the National Park Service’s centennial this year, visitors to many of the U.S. parks have told CNS the peace and beauty offered by these preserved outdoor spaces help them connect spiritually and the worship spaces inside the park perimeters add to that experience.